The natural environment has always struck me as important, being one of a generation raised upon Sir David Attenborough’s exquisite natural history documentaries. A defining moment for me was the realisation that the landscapes that surround us in Britain are picturesque, but are a long way from natural. This realisation has since led him to wonder what has been lost in this transformation. Is it important? If so, how can we go about restoring and living within more natural systems? These are the questions that have taken me down a path of study and research and led me to the conclusion: we are increasingly ready and able to integrate human and ecological systems for the benefit of all. I studied the theory and practice of environmental biology and geography at St Andrews University, and during my MSc designed and created a biodiversity action plan for the Glen Livet Crown Estate to help improve their stewardship of the land. This project led me further north to work at Alladale in the Scottish Highlands, a place that aspires to create a fenced wilderness reserve with wolves, wild boar and bison – our very own Kruger or Yellowstone National Park. Here, I carried out D.Phil. 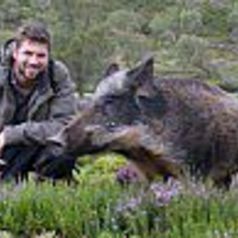 with the WildCRU of Oxford University, studying how wild boar and wolves can be used to help reinstate the Caledonian Pine Forest. This work in turn led me to research the concept of ‘Rewilding’, the restoration of key ecological processes by reintroducing lost keystone species, at the University of Aarhus, Denmark. I am now a Lecturer in Biology at the University of Sussex and Director of Wild Business where I seek to better understand and apply the concepts of rewilding. I am a lecturer in Biology, specialising in rewilding and paleo ecology. My research seeks to understand the natural functioning of ecological processes such as predation, herbivory and disturbance. I then apply this research to improving conservation practices in the field of rewilding. Rewilding seeks to reverse the decline in biodiversity through the restoration of natural processes, typically by speices reintroduction. The ultimate aim of rewilding is to restore ecosystems that are rich in biodiversity, provide a balanced suite of ecosystem services and are themselves self-sustainaing.